2010 Mazda3 5-Door Review: The redesigned Mazda3 looks very happy with its grinning face, the way Mazda’s people must feel over the success of the previous generation model. In 2008, the Mazda3 represented 44 percent of the Mazda’s sold in North America. Combining the right size and features with an affordable price and plenty of driving fun, it seems just about perfect. That doesn’t mean it should, or can, remain the same. After five successful years, the 2010 model is significantly improved in many ways, from styling, to safety to driving dynamics. Now there’s even more to love. The 103.9-inch wheelbase remains the same, but length is up by three inches. The highly efficient and useful proportions remain. Americans are rediscovering the joy of the 5-door hatchback, room for stuff, but no more car than you need. With the dramatic restyling of this generation 3, based on its stunning 2006 Nagare concept car, utility is not the focus, just a benefit. The first thing you’ll notice about the 2010 is that smiley face. This isn’t just happy, but a full-on grin. Is it pleasure or a little bit wicked? My first thought was of Batman’s Joker, especially in the Crystal White Pearl Mica paint my tester wore. "Mazda has never been afraid of taking design risks," says Carlos Salaff, a senior designer at Mazda North American Operations. “We wanted the MAZDA3's dominant grille design to be bold because that will separate this car further from the blasé competitors and, by leaping ahead of the crowd, keep us looking fresh even late in this product's life." The overall body shape remains, but numerous enhancements give the car an aggressive look, like it’s about to pounce. Flow lines from the Nagare shimmer on the hood and sides. This is both for looks and to reduce aerodynamic drag and lower wind noise. A Harley motorcyclist admired my test car as we sat at a traffic light. It turns out he owns a 2005 model, and he really liked the upgrade. California vehicles, with a partial zero emission vehicle status (PZEV), lose two horsepower and 1 lb.-ft of torque, but come up with exemplary EPA Green Vehicle Guide numbers, 9.5 on the Air Pollution score and 7 on the Greenhouse Gas score. Fuel economy is 22 City, 29 Highway with the automatic and, surprisingly, 21/29 with the six-speed manual. I averaged 20.9 mpg with the automatic. Sitting behind the wheel you feel like you’re ready to rock. Large gauges front and center give you the details, while the sweep of the console and dash have you feeling like you’re in motion before you release the parking brake. Mazda aims for a mix of serious driving attitude with a hint of a luxury that’s a level above where the car sells in the marketplace. There’s some of the intentional design language of a BMW in there, in serious black with silver accents. This is a clever, fascinating car, with things like the flickering blue line of light at dash center when you make changes to the radio. While driving information lives in the two large gauges, a slim strip along the dash top contains other information, including the optional navigation system screen. Although small, it’s up where you can see it without looking away from the road, something Honda has introduced in its recent vehicles as well. Driving the Mazda3 is as enjoyable as in the previous version, with only some minor tweaks to an already fine platform. For example, there’s a third mounting point for the rack-and-pinion steering to improve precision and feel (which was already great). The rubber-isolated front and the rigidly mounted rear subframes were enhanced to improve rigidity while saving weight. A new weld bonding process for the unibody improves torsional rigidity. It all adds up to a very satisfying driving experience. Pricing for the Mazda3 5-door starts at just $19,980 for the Sport with manual transmission, including shipping charges. The Grand Touring, like my tester, lists at $23,050 with the automatic, also including shipping. 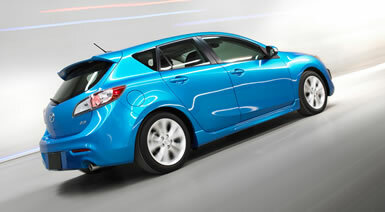 The base Mazda3i 4-door sedan retails at just $15,795, as this is Mazda’s entry vehicle in America. I have enjoyed and recommended the Mazda3 for years and this new one remains on my short list. Appropriately sized and prized, highly reliable, and a blast to drive, it should remain a hit for Mazda.